GLENDALE, Ariz. – Really, what it had come down to for Andre Ethier is timing, a problem when camp is only just getting started and he’s stuck in a circle of reporters clarifying his wishes while dozens of his teammates are watching his explanation bleed into their team meeting. He is coming up on 33 years old, which isn’t so young anymore. He is guaranteed another $56 million over the next three seasons. The man who guaranteed that contract has been reassigned. The new man won’t be asked by anyone to justify that money. And then, all this happened when the Los Angeles Dodgers were overrun with outfielders, young ones and older ones, so Ethier – not a loud complainer by nature but also moved to defend himself and his game – found he’d been cornered by circumstance. And timing. He could wear it or not. So he stood Tuesday morning picking over his words, unwilling to surrender regular at-bats or his position on the matter without a tussle, unable to stop believing in the ballplayer he was or can be, and fairly sure he’ll be cast as the villain if and when this thing is resolved. His plan is to be a regular outfielder. You know, somewhere. 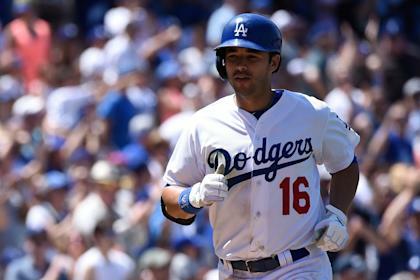 Ethier grants there are complications in L.A. The list of current outfielders goes like this: Carl Crawford, Yasiel Puig, Joc Pederson, Ethier, Chris Heisey and Scott Van Slyke. Even with Matt Kemp in San Diego, that’s a lot of guys. He also believes the complications were not of his making, nor should they be his problem. And he happens to believe he’s one of the three best outfielders in camp, which he may or may not be right about, but he’s certainly allowed to think so. After hitting .284 with 20 home runs in 2012, Ethier lost some at-bats in 2013, and then spent the better part of 2014 out of position – in center field – or sitting on the bench. He was the good employee last season, when there were enough malcontents that he probably couldn’t have been heard over the moaning anyway. But now he’s being told – or believes he’s being told he may no longer be skilled enough to have an everyday position, though in part the opinion is based on his production over a season in which he was a part-time player. The Dodgers contend he was a part-time player based on his production and their own better options. And you see where this gets tricky. There’s more. Ethier would prefer not to play center field, because he’s not a center fielder, not when he’s going on 33, an age when outfielders generally are being moved out of center field. And while Mattingly seemed to suggest Ethier could be a quick study at first base (where Adrian Gonzalez plays), Ethier would resist that as well, because he’s not a first baseman either, he’s an outfielder, and there wouldn’t be any at-bats out of first base anyway. Right about now you’re wondering about what time Ethier would like the limo to come by every morning and if he prefers his outfield grass bent to the left or right. But I’m not sure it’s that way. First, for the athlete he is and the ballplayer he might still be, Ethier has a curious underdog streak in him. He’s almost always felt overlooked and undervalued. So he spent the better part of a reasonable career chasing respect, perhaps even appreciation, when, granted, it probably was there all along. We find our motivation where we find it. Second, he has that career to tend to while it lasts. Those checks will keep coming whether he’s pulling 600 at-bats out of a corner outfield spot or not. He’d rather earn them. He’d rather have more career left. He’d rather prove he can still play while he, you know, can still play. It’s pride. It’s stubbornness. It’s confidence. All the stuff that made him a good player to begin with doesn’t go away when your manager decides you’re the fourth or fifth outfielder. So when he tells the Dodgers he expects to play and they say, OK, go play then, he merely hopes he can take them at their word. Ethier doesn’t want to be the hard guy here. It’s not his nature. Neither is confrontation. He’d rather not distract from a clubhouse that is just now getting to know itself. (He won’t, by the way. It’s February. Ballplayers generally putter around in their own ecosystems, especially in February.) He’d like to be part of it. But here we are. And right on time.